Order on-line at http://renewrichmond.org/shop/ by 5pm Wednesday for pick up at The Temple of the Cosmic Mothership (6 W 21st St. on south side) on Thursday, from 4-7pm. Don’t miss the new moon market Wednesday, November 11, 5 to 9pm. Last night was an after-party and reception for artist Nicole Renee Randall who has a show currently up at Eric Shindler Gallery through November 14th. 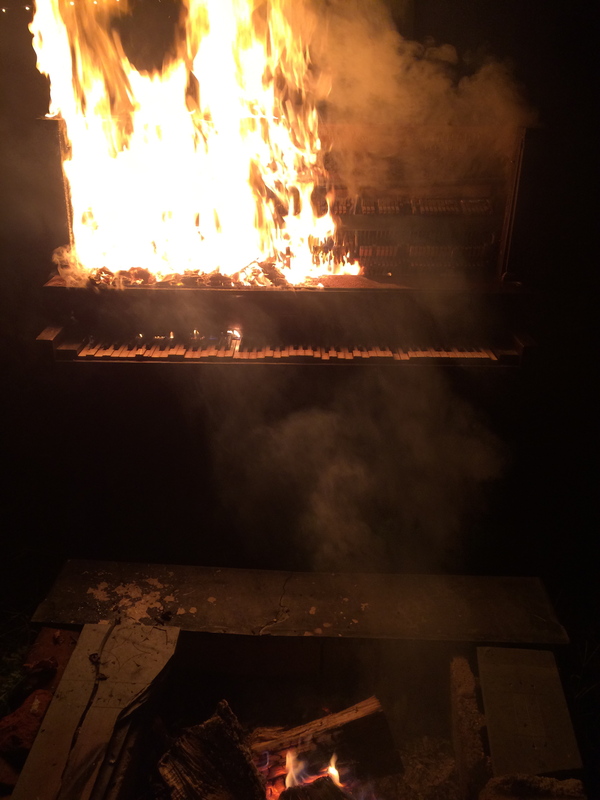 We celebrated by burning an old dead piano, with poetry, singing and merriment. Hey Y’all, there are two spaces open at the Mothership for the right person. We are looking for independent, hard working artists/artisans/craftspersons who want to work in a open floorplan with access to loading dock, plenty of electricity and shared kitchen space. Plenty of outdoor space for big projects. Rent is affordable. This year’s projects for the Mothership will revolve around fighting gentrification. It is a well know fact that once the “artists” show up in a neighborhood of predominantly non-white citizens, it becomes a neighborhood at risk of development. This development almost never supports the resident community and places them at risk of loosing established neighbors in lieu of condos, Starbucks and Chipoltle. We want to work against this trend. Three things are going to happen in the next year. The first, “Homework Help” is a service offered to residents of Swansborough and Manchester after school starting at 3:00pm every Wednesday beginning in September. We will offer a healthy snack, and tutoring or just quiet space to read and relax until 6:00pm. We are looking for volunteers for this program, you must pass a background check and have experience working with 9-17 year olds. The second, is a gathering, the date TBD to listen to residents and community leaders of Swansborough and Manchester to see what they feel is a positive way to utilize The Mothership. Lastly is to implement the idea put forth at these meetings that shows the most promise as an aid to the community. As the date of the meeting is set, a sign up sheet will be attached to the website. Moonshine, RPGs, a specially brewed batch of beer with an artist (Wayne) made label. Gaming gaming and more gaming. I managed to film three of the 12 participants before one of the last days descended into a NOFX fueled chaos. 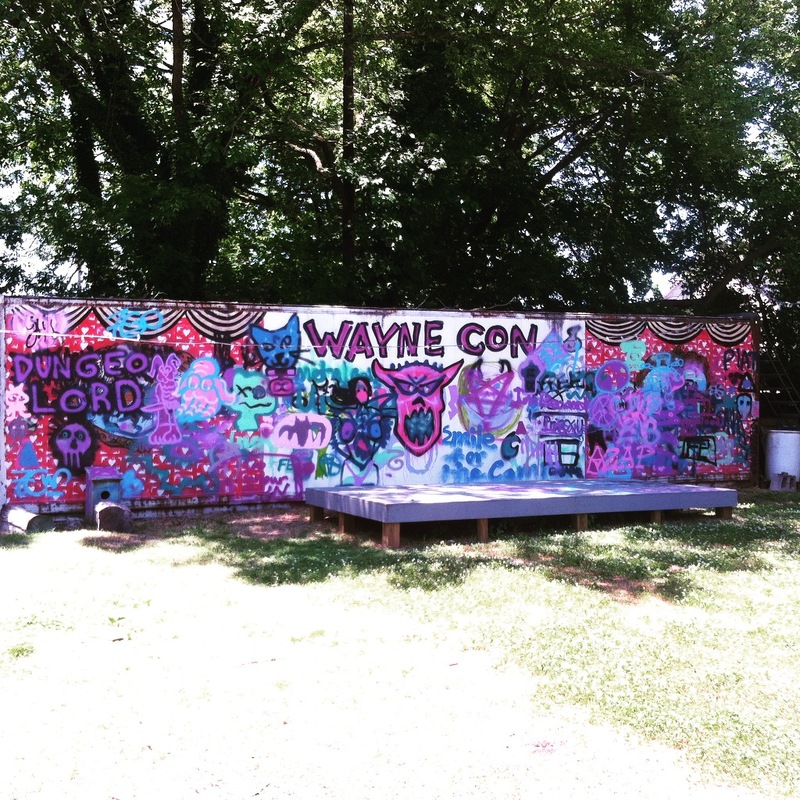 Thank you to all of you wonderfully weird people involved in WayneCon. People came from all over the country to play games and have fun. It was a pretty amazing time. Guess what? The City of Richmond’s zoning and code enforcement has issued a stop work order and violation for The Mothership. I have contacted the ACLU and hope that we can get this worked out. This is not surprising, considering they depend on Style Weekly articles to do their research and are masters at retaliation. Until further notice church services have been delayed. I hope to see you on a Sunday soon!